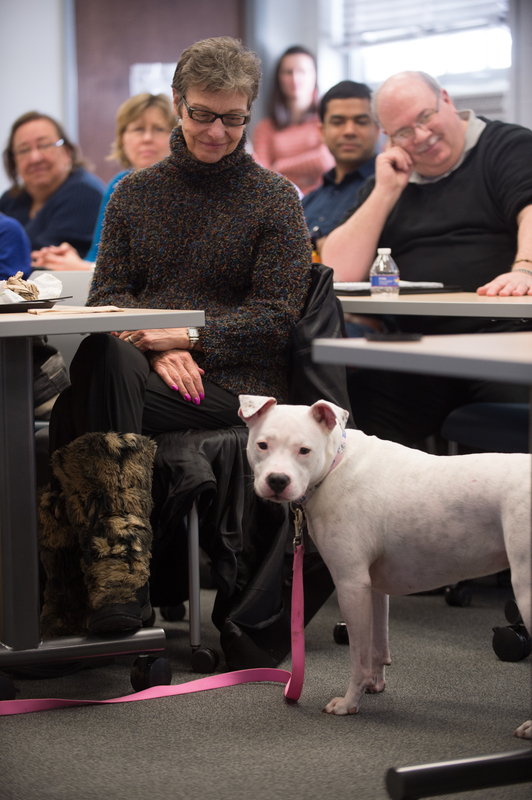 Those normally part of the bustling traffic of the UB Student Union were halted in their hurried tracks during a lunchtime last year by the presence of two shelter dogs at an exhibit table. They were, in a sense, manning an exhibit for an organization called Dog Tags Niagara with their human companions who were military veterans. Jacob Silver, a junior in biomedical sciences, was among those who paused. A Marine Corps veteran himself carrying on his education after two tours in Afghanistan, he struck up a conversation with Mike, an Iraq war veteran dealing with transition and adjustment to civilian life, who proceeded to explain how Dog Tags turned his life around, and how it’s doing the same for fellow vets experiencing the after-effects of combat. The dogs looked as though they wanted to extol the benefits of the program as well. 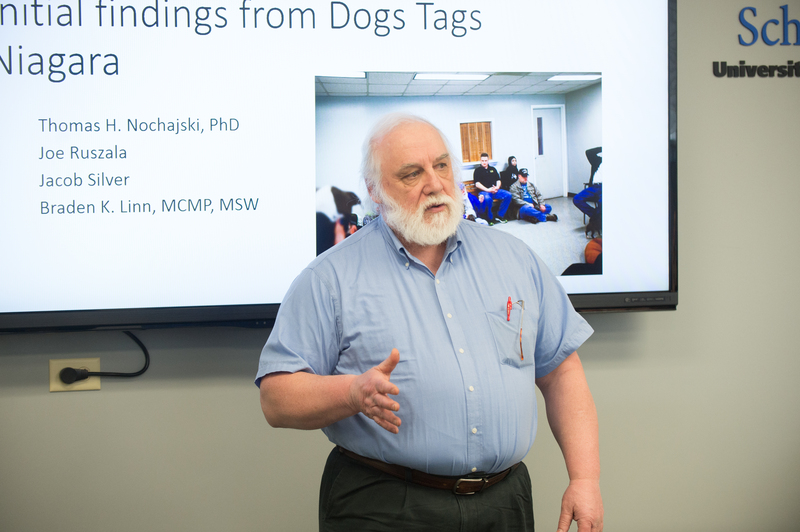 Thinking the mission of Dog Tags Niagara would make for a highly relevant research project, the pre-med student began to send emails out to various UB departments, eventually grabbing the attention of SSW Research Professor Thomas Nochajski. 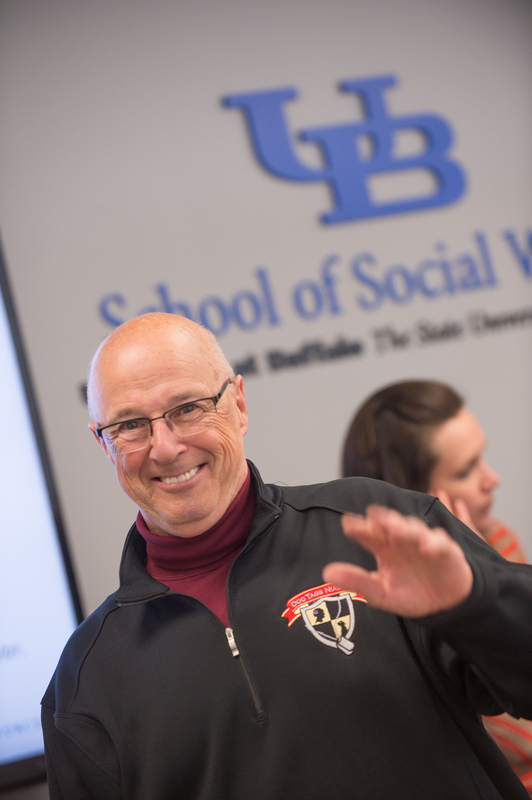 Nochajski felt that the research idea would be fitting for the Joining Forces-UB program, a collaborative project between the SSW and the UB School of Nursing aimed at training students to better care for veterans coming to them in a health care setting, whether for their mental or physical health. As a wounded Marine Corps veteran of the Vietnam War, Nochajski knows combat. “But I also know that combat is an individual thing. The overall traumatic experience is the same, it’s how that gets interpreted by the individuals. That has a big role in this,” he explains. Joe Ruszala, an Army Vietnam veteran, helped launch the Dog Tags Niagara program at the Niagara County SPCA on Veterans Day 2013. Its mission is to heal the wounded soldier whose damages are unseen, and to heal the wounded animal whose trust has been broken. The veterans work with the abused or abandoned dogs at the shelter, making regular visits with the intent of rehabilitating the dogs for adoption. In the process, they are helping themselves. 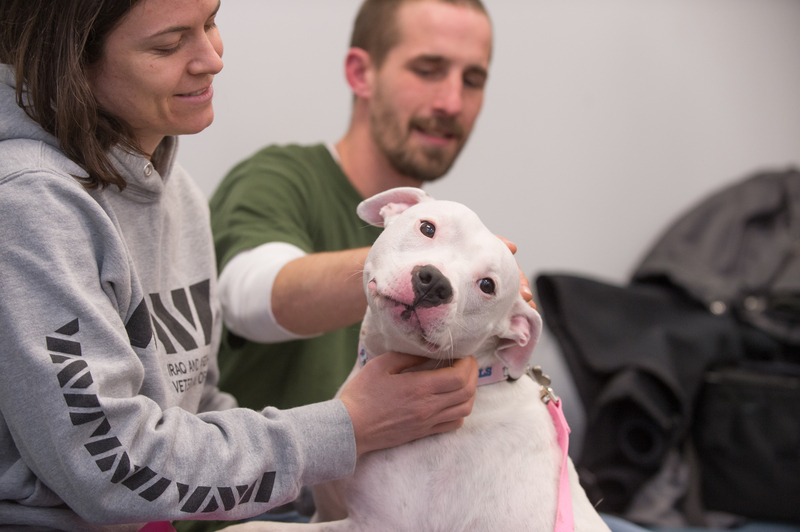 Nochajski calls it a “two-way street of healing.” He is researching the effects of this project on both the veterans and dogs through a series of interviews with the participating veterans, SPCA staff, and those who have adopted the dogs. Silver is glad to be included in the research interviews, as is Brad Linn, doctoral student graduate research assistant. This is a low-pressure way for the veterans to connect with another living creature. If they’re having a bad day or feeling kind of blue, they’ll go to the SPCA and work with the dog. There’s something about that process that’s really helpful for the vet,” says Linn. Nochajski indicates that the preliminary research results support what might be expected given the literature and research on pet therapy. Jewell is attentive during the Joining Forces-UB Brown Bag Lunch. 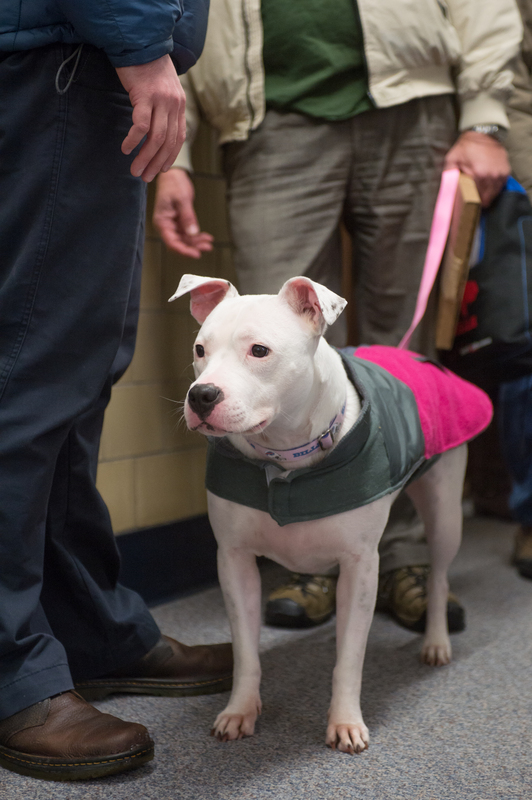 Jewell is a graduate of Dog Tags and a newly certified therapy dog. She stole the show! “When the vets get the dogs, the vets are in a situation where they feel like they’ve been abused and tossed away. The dogs are in the same situation. So they can communicate,” he observes. 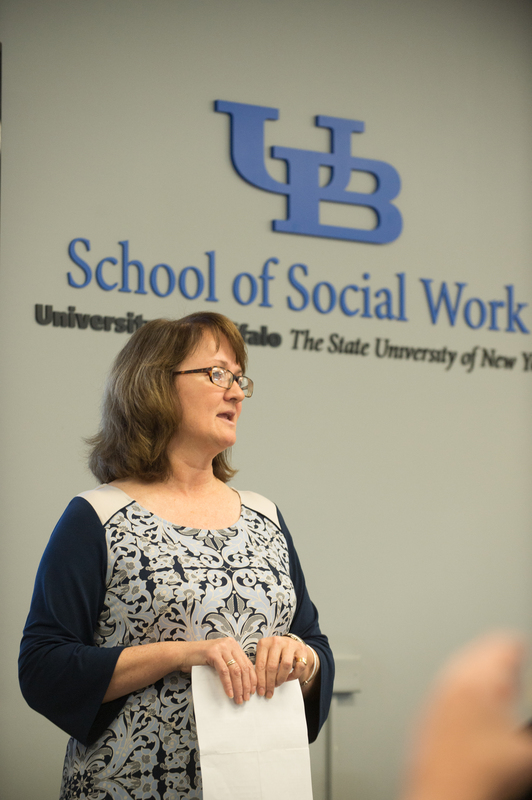 Associate Professor Lisa Butler, principal investigator of Joining Forces-UB, feels the Dog Tags project is particularly fitting for the program’s objectives. 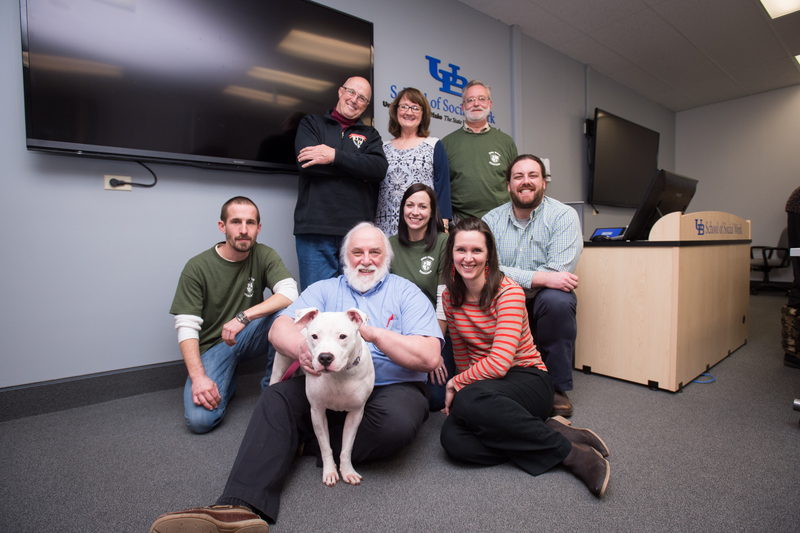 Dog Tags Niagara staff, UB researchers and Jewell. Look for more Mosaics stories here. This article is a great inspiration and this is an outstanding project to have in the works. I think it’s great to see that a student in one field was to connection with a faculty member in a completely different field to make this idea come to life. Being a student at UB and an avid dog lover, I think its great to take a more expanding group of individuals in need and give them an outlet that is much different from what most people would plan for them; I also feel that it’s so inspiring to use a breed of dog that is given such an awful stigma and pairing them up with individuals that are also given a stigma when they come home. I think that since both groups are put in a place either when they come home or even when they are born that they are given a label and its not really given a second chance. I think this could lead into a larger project and an even larger message to the community. Of the more than three million veterans who have served in Afghanistan and Iraq (http://www.bls.gov/news.release/pdf/vet.pdf), the National Center for PTSD indicates that the prevalence of post-traumatic stress disorder (PTSD) is 11% to 20% (http://www.ptsd.va.gov/public/PTSD-overview/basics/how-common-is-ptsd.asp). 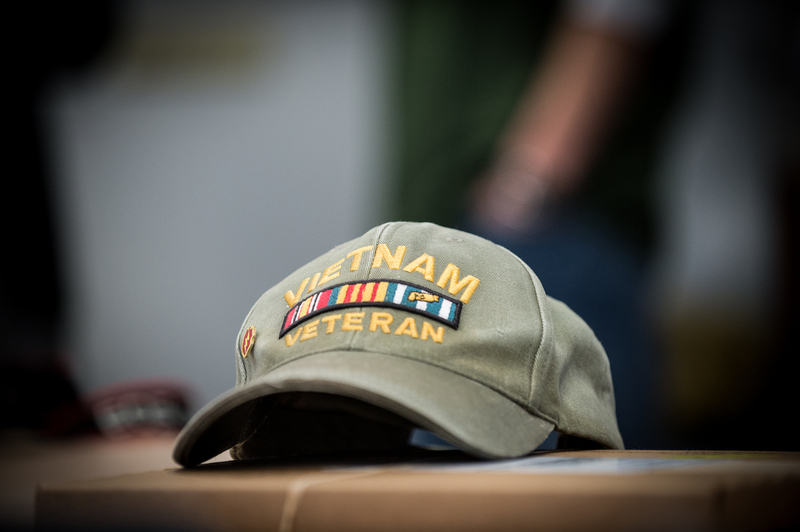 Veterans who have experienced this trauma need trauma-informed care. It struck me when reading the “Vet’s Best Friend” post that Dog Tags Niagara teams up dogs and veterans to provide each other with trauma-informed care. The Trauma-Informed Community Initiative of Western New York (http://www.wnytrauma.org/) states that the five pillars of trauma-informed care are safety, trustworthiness, choice, collaboration, and empowerment. It is easy to feel safe with dogs. They do not have any complicated emotions to deal with. A wagging tail and a doggie grin can sway even the most guarded individual. Dogs clearly want to trust people. Show them a little kindness and they are your friend. They do not care what is “wrong” with you. Nobody will trust you more consistently than a dog. Once a dog trusts you, they are happy to give you the control. They will go along with whatever choice you make. Dogs are team players. Collaboration is fine with them. A dog will be by your side through any task. Make friends with a dog and they will love you forever. Nothing is more supportive and empowering than unconditional love.